Relations with the Russian Government. 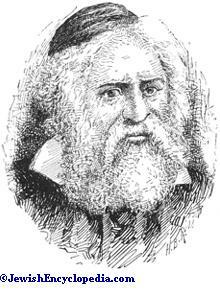 Russian rabbi and author; born at Rosh, government of Grodno, 1817; died at Kovno March 6, 1896. His father, Israel Issar, who was rabbi of Resh and had a leaning toward Ḥasidism, was his first teacher. Young Isaac Elhanan made remarkable progress in his Talmudical studies, and was soon famous as an "'ilui," or prodigy. At the age of thirteen he married, and settled with his wife's parents in Vilkovisk, where he remained for six years. He was for a short time the pupil of R. Elijah Schick; and later he studied under Benjamin Diskin, rabbi of Vilkovisk, who, much impressed by his agreeable manners and great ability, accepted him as a pupil and as the fellow student of his son Joshua Löb Diskin, afterward rabbi of Brisk. Spektor received his "semikah," or ordination, from Benjamin Diskin and from R. Isaac Ḥaber of Tiktin (later of Suwalki). The 300 rubles which his wife had brought him as dowry having been lost through the bankruptcy of his debtor, Spektor, being unable to rely any longer on his father-in-law for support, became in 1837 rabbi of the small adjacent town of Sabelin, with a weekly salary of five Polish gulden. He remained there in great poverty for about two years, when he went to Karlin and introduced himself to R. Jacob of that town (author of "Mishkenot Ya'aḳob"), then considered one of the foremost rabbis of Russia. Jacob was so favorably impressed by the extensive learning and the carefulness of the young man that he recommended him to the first community desiring a rabbi, namely, that of Baresa, where the salary was one ruble a week. Spektor entered upon his new charge in 1839, and made rapid progress. A dispute which he had with Rabbi Isaac of Shavel concerning the formula of a document relating to divorce ended when Isaac, who was much older and better known than Spektor, acknowledged the latter to be in the right. In 1846 Spektor was chosen rabbi of Nishvez, government of Minsk; but the community of Baresa was unwilling to let him go, and he was obliged to leave the town at night. The salary of his new position, four rubles a week, was a munificent one for those days; and at first many of the older members of the community objected to so young a rabbi. After he had become known, however, his popularity was such that when he decided to accept the rabbinate of Novohrodok (government of Kovno), whose community had exonerated him of a false charge made against him by an informer of Nishvez, the people of the latter town wished to restrain him; and he had to leave it, as he had left Baresa, stealthily at night. He went to Novohrodok in May, 1851, and remained there until the same month in 1864, when he accepted the rabbinate of Kovno, which he occupied until his death. 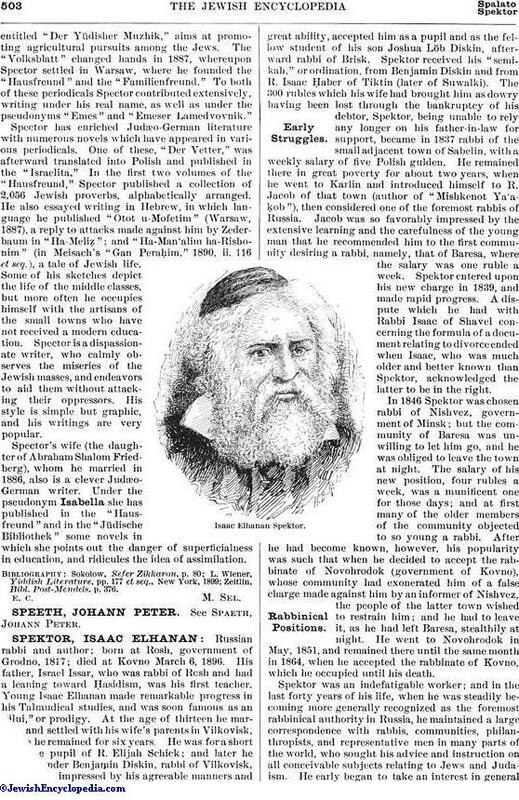 Spektor was an indefatigable worker; and in the last forty years of his life, when he was steadily becoming more generally recognized as the foremost rabbinical authority in Russia, he maintained a large correspondence with rabbis, communities, philanthropists, and representative men in many parts of the world, who sought his advice and instruction on all conceivable subjects relating to Jews and Judaism. He early began to take an interest in generalJewish affairs; and his sound reasoning, his liberal views, and his love of peace combined to establish him as one of the great leaders of Russian Jewry. 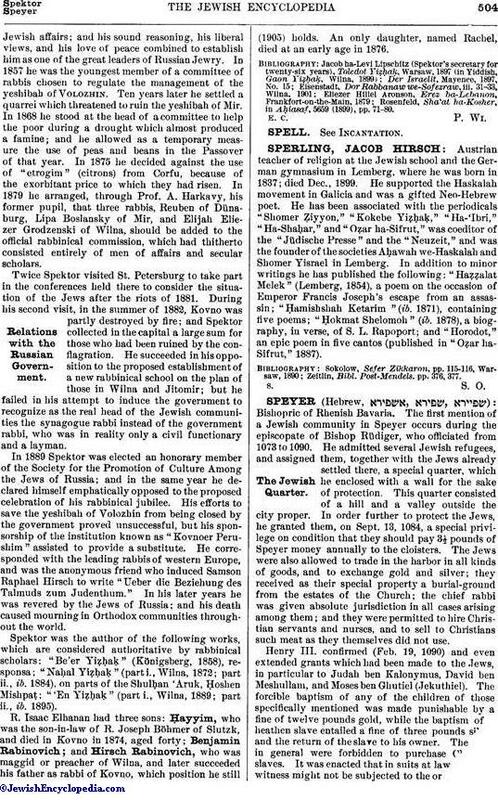 In 1857 he was the youngest member of a committee of rabbis chosen to regulate the management of the yeshibah of Volozhin. Ten years later he settled a quarrei which threatened to ruin the yeshibah of Mir. In 1868 he stood at the head of a committee to help the poor during a drought which almost produced a famine; and he allowed as a temporary measure the use of peas and beans in the Passover of that year. In 1875 he decided against the use of "etrogim" (citrons) from Corfu, because of the exorbitant price to which they had risen. In 1879 he arranged, through Prof. A. Harkavy, his former pupil, that three rabbis, Reuben of Dünaburg, Lipa Boslansky of Mir, and Elijah Eliezer Grodzenski of Wilna, should be added to the official rabbinical commission, which had thitherto consisted entirely of men of affairs and secular scholars. Twice Spektor visited St. Petersburg to take part in the conferences held there to consider the situation of the Jews after the riots of 1881. During his second visit, in the summer of 1882, Kovno was partly destroyed by fire; and Spektor collected in the capital a large sum for those who had been ruined by the conflagration. He succeeded in his opposition to the proposed establishment of a new rabbinical school on the plan of those in Wilna and Jitomir; but he failed in his attempt to induce the government to recognize as the real head of the Jewish communities the synagogue rabbi instead of the government rabbi, who was in reality only a civil functionary and a layman. In 1889 Spektor was elected an honorary member of the Society for the Promotion of Culture Among the Jews of Russia; and in the same year he declared himself emphatically opposed to the proposed celebration of his rabbinical jubilee. His efforts to save the yeshibah of Volozhin from being closed by the government proved unsuccessful, but his sponsorship of the institution known as "Kovnoer Perushim" assisted to provide a substitute. He corresponded with the leading rabbis of western Europe, and was the anonymous friend who induced Samson Raphael Hirsch to write "Ueber die Beziehung des Talmuds zum Judenthum." In his later years he was revered by the Jews of Russia; and his death caused mourning in Orthodox communities throughout the world. Spektor was the author of the following works, which are considered authoritative by rabbinical scholars: "Be'er Yiẓḥaḳ," (Königsberg, 1858), responsa; "Naḥal Yiẓḥaḳ" (part i., Wilna, 1872; part ii., ib. 1884), on parts of the Shulḥan 'Aruk, Ḥoshen Mishpaṭ; "'En Yiẓḥaḳ" (part i., Wilna, 1889; part ii., ib. 1895). R. Isaac Elhanan had three sons: Ḥayyim, who was the son-in-law of R. Joseph Böhmer of Slutzk, and died in Kovno in 1874, aged forty; Benjamin Rabinovich; and Hirsch Rabinovich, who was maggid or preacher of Wilna, and later succeeded his father as rabbi of Kovno, which position he still (1905) holds. An only daughter, named Rachel, died at an early age in 1876. Rosenfeld, Sha'at ha-Kosher, in Aḥiasaf, 5659 (1899), pp. 71-80.